People buy Android devices because Android OS provides several customization options. Unlike Windows and IOS devices, you can change drawer style, icons, animations in Android OS by installing a launcher app. Although you can configure Windows phone launcher to show email notification and climate details on the home screen, you can’t customize the tile that displays the details. Android OS offers a special and important feature called widget. People add widgets to the empty areas on the home screen of their device. A widget may display new emails, time, weather, etc. It can also show an animation or an image without draining the battery juice. Last week, we had shared the list of best Android clock widgets. 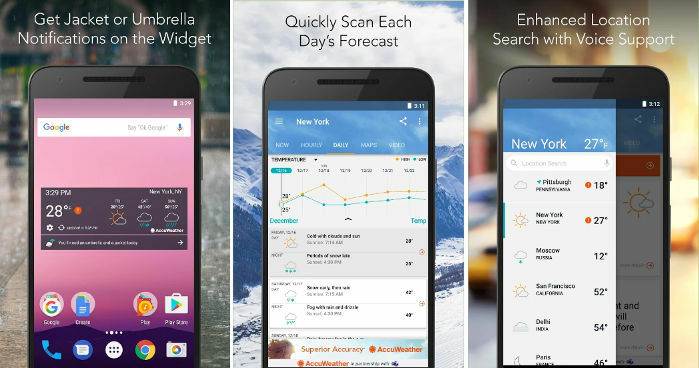 Today, we have covered the best Android weather widgets. If you are searching for a standalone weather widget for your Android device, download one of the following apps. WACW from DevExpert.net is a weather app that has a simple UI and many features. It enables you to see the weather for the coming 10 days. It has an option to share the weather details with other users. 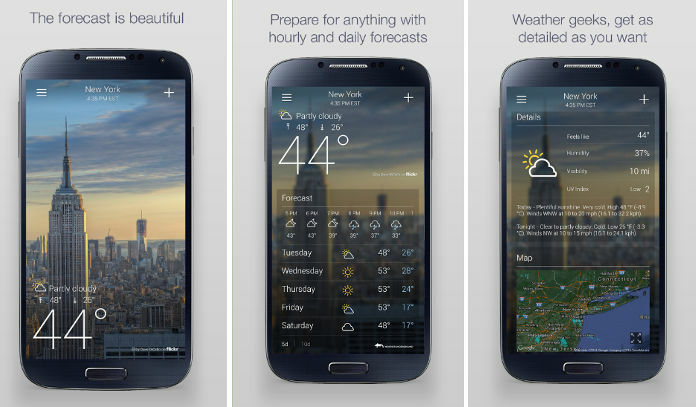 The app adds 10 new weather widgets to your device. The larger widgets display the humidity, pressure, wind speed, climate, etc. The smaller widget will display the weather forecast only. The application supports mobile devices running on Android 2.3+ OS. To see the weather in your area, you must help the app in identifying your location. To do so, enable location access permission for third-party applications. If WACW doesn’t detect your location, run it and choose the “My location” option. Now, locate your address on the Google Map manually. 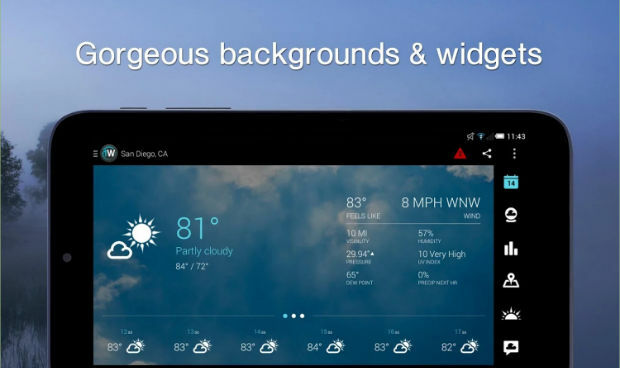 TWW is an application that adds customizable and resizable weather widgets in your mobile device. The widget has a transparent background and its app has a material design. You can change the text font, background color, and icon of the widget generated by this application. The application features 7 icon libraries. When you run TWW, it will try to identify your location. If it fails to detect your address, you must enter the name of your city in the text box displayed on the screen. The app enables you to set a weather information refresh time. It provides weather forecast for up to 7 days. It can provide climate details of up to 10 different locations. 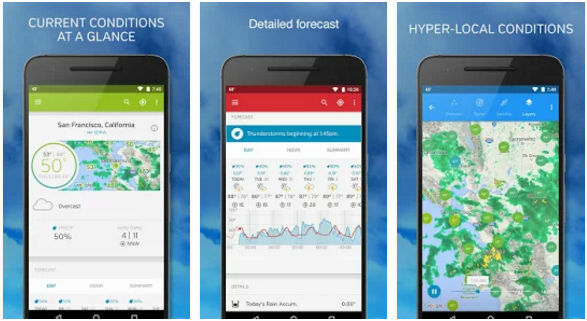 1Weather is one of the most accurate weather forecasting apps on the Google Play Store. It provides real-time detail of the climate at your place. The app has a great design. Its main interface flaunts 5+ tabs that provide details of the weather, sunrise/sunset timing, precipitation level, etc. One of the tabs allows you to see the weather radar. 1Weather provides a simple weather widget that displays only one image and the current temperature. It also offers a widget that shows climate information in detail. The 1W app displays cool weather facts when you run it. WU is an easy to use app that displays important details of the weather of your place on a single interface. Hence, you don’t have to explore the application to get details of the climate. The app gives you access to live webcams. It allows users to report weather details to the WU service. The information shared by you will be useful to other users. Apart from climate information, the WU app makes you aware of the air pollution level, viral disease updates, Ultra Violet Rays radiation risks in the city you’re planning to visit. The app supports push notifications. It offers 3+ customizable widgets. Yahoo, one of the leading internet companies has launched several apps on the Play Store. Its weather app is a widely used application. It has about 50 million active users. YW employs amazing graphics and animations to display climate information. It enables you to track weather in up to 20 cities. To get started with this application, users must specify their location by placing their finger on the screen and swiping right. YW allows users to submit photos and explore maps that display the direction of the wind, pressure, etc. It supports weather forecasting. Like other apps we’ve covered here, YW provides weather radar module. AccuWeather is a beautiful Android app that provides every important detail of the climate of your city. The weather app can alert you of severe weather condition. It displays precipitation forecast in real-time and has the option open the weather radar module. AccuWeather allows users to watch weather videos. It also lets you go through the weather news of your region. It makes you aware of weather information for the 15 coming days. AccuWeather supports 30+ languages. It can save infinite locations. It supports 24-hour and 12-hour formats. To make the analysis of weather easier for the user, the app can generate graphs of various types. Conclusion: The above Android weather apps provide correct information on the climate. They offer customizable widgets and have a superb user interface.